The concept of customer development is to make existing customers as valuable and profitable as possible. What are the tactics associated with customer development and what are the kinds of things that companies do to create and attract more value from their existing customers? We will consider four different tactics. The first tactic is cross-selling, the idea of getting customers to buy more than just the particular product that interests them. In many fast food restaurants, we hear servers asking, “Do you want fries with that?” Another common example occurs when getting an oil change. The mechanic asks “would you like the air filter changed and the tires rotated?” Both are examples of cross-selling as it encourages people to buy other products or services. Suggested products can either be from the same product or similar product categories. The picture above shows Amazon's recommendations for similar products and different product categories. Cross-selling isn't about manipulating customers and is most effective when you stick to extra items the customer would have a genuine interest in acquiring. Items that are well–connected to their original choice. Step over that almost invisible line, and you'll look pushy and transparent, but if you stay safely within the boundaries of relevance and restraint, customers appreciate the suggestion. For example; Apple's iTunes store for music offers a list of “others who purchased this song also bought these songs” for sampling. A service that introduces their customers to Music and Musicians they otherwise might never have encountered. The enjoyable aspect of their recommendation is the ability to sample the music. The second tactic is up-selling. The classic fast food example is, “do you want to super-size?” Up-selling is the attempt to get people to buy a higher margin version of the same item. This tactic is prevalent not just in fast food but financial services and many industries. You shop for a Jeep Wrangler, and the salesperson makes you aware of the advantages of the four-door Wrangler. A common upsell tactic in devices and appliances is suggesting an extended service contract. This tactic can present the customer with difficult choices. For example when the recommended upgraded product has dubious benefits. When replacing a tire, the customer is asked whether they want the longer life tire. Tires are commodities customers are likely not to have expertise with, and their decision might be based on their trust in the advice of the salesperson. If you are not hovering over the keys of your computer precisely at noon on Monday, when the next week’s classes are released—or do not want to pay $3,500 for a “SuperSoul ” series of 50 classes (at $70 a pop) that gives early access to reservations—then you’re often resigned to waiting-list purgatory. “I would do anything that I could to afford these rides, ” says 27-year-old Jaime, who often takes thirteen classes a week (estimated cost: $21,632 per year). She’s arranged her schedule to have Mondays off work so that she can always be at her computer the moment classes are released. She counts her instructors among her closest friends. Her social life revolves around people she’s met at SoulCycle. The typically 45-minute-long stationary-bike classes combine hard pedaling, weightlifting, house music, candles, and inspirational phrases: “Athlete. Legend. Warrior. Renegade. Rockstar. SoulCycle, ” reads one of the mantras on the studios' walls and merchandise. Across the country, classes allegedly get 10,000 riders per day and 20,000 per week that connect to the communal power of the classes. The company also sells $54 T-shirts, $78 sweatpants and $58 tote bags with the SoulCycle logo stamped on them. Its apparel has “become the uniform of choice both inside and outside the studios. Our silver retail bags can be found in airports, on street corners and in households across the country.” The company boasts of a significant social media presence, saying that it had more than 70,000 Instagram followers, 53,000 Facebook fans, 36,000 Twitter followers and 18,000 Spotify followers. 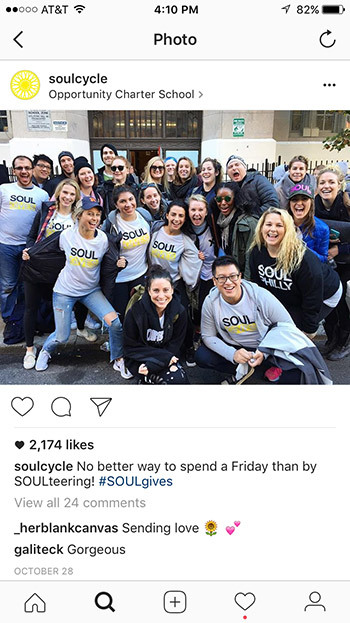 SoulCycle manages customer retention though “the communal power of their classes.” They cross-sell clothing and upsell the “SuperSoul” series of 50 classes. And they promote the benefits of frequent visits. SoulCycle will soon be a public company which will provide visibility on their ability to retain customers over an extended period. The fourth tactic is managed margins. Different customers pay different prices for the same product or service. Some companies are hesitant to use this tactic. Ironically, this is what happens when volume or senior discounts are offered. When we consider customer-centricity this tactic at times makes a lot of sense. Amazon, in October 2015 opened its first brick and mortar location, an unimpressive shop in an outdoor mall in Seattle. The store sells mostly books, with some magazines and a central aisle of electronics, including its Kindle, Kindle Fire, and FireTV products as well as a few accessories like headphones. Every book has a shelf tag that includes a capsule review from the Amazon website, a star rating, and a barcode. There are no prices listed. What metric do firms use to gauge and guide their development activities? A variety of metrics are used, but again, the basic question is how well-developed is this customer for the firm? Alternatively, look at it the other way around and ask, how well developed is this firm in the customer's mind or the customer's wallet? A common metric that is used here is the share of wallet. This is the percentage of a customer’s spending within a category that’s captured by a given brand, or store or firm. Customer lifetime value, can also be defined as the dollar value of a customer relationship, based on the present value of the projected future cash flows from the customer relationship. Differences exist among people, either regarding observable characteristics, such as demographics or behavior or regarding unobservable characteristics, such as preferences or purchase intent. Just how much value does this customer have? Research studies have looked at the interplay of the size of wallet and share of wallet. They have concluded there seems to be no systematic relationship between share of wallet and size of wallet. Therefore, the share of wallet is mostly independent of the size of wallet. In other words, a well-developed customer isn't necessarily more valuable than a less developed customer. This is a very significant point as it suggests that while we want to develop our customers, at the margin, we prefer our customers to be more valuable to us. Understand though it doesn't necessarily maintain a real strong causal relationship with overall customer life time value. Let’s review another quote that nicely summarizes the good news and the bad news regarding cross-selling and other customer development activities. The good news is if we maintain a high share with the customer, and they purchase a lot from us in one category, then they are likely to buy from us in other categories. For instance, if we sell them a checking account, chances are we can get them to get a savings account from us as well. That's the good news. The bad news is this suggests that some customers just inherently love us and this is heterogeneity. One customer may buy everything offered, while another customer may take it or leave it. A customer may purchase a particular service from us, but they are not necessarily going to become better customers all of a sudden if additional services are offered to them. Ideally, customer development requires up-selling and cross-selling. For example, do you want fries with that or do you want to super-size that? Companies will continue to seek opportunities to create and extract a little more value from their customers. Many of them believe that these developmental activities will systematically and fundamentally change the overall value of their customers. For the most part, this is untrue, but on the whole, development activities are good. Development activities are like icing on the cake, but they're not necessarily going to change the nature of the customers fundamentally. They enable businesses to create and extract more value than they would have had otherwise but do not significantly change the customer. Some companies would disagree with this and say, “you know what, we put this offer in front of the customer and not only did they take it, but they bought lots of other things as well.” This may be true, but here is the point. Heterogeneity suggests that this customer was actually pretty valuable all along or had high potential value all along. As a company, we are unable to experience it and to unlock it. So, the company is going to pursue development activities not to change the customer fundamentally, but to find out what kind of value they already had locked in them and help the business unlock it so to discover it thoroughly. That's why companies have to do development activities, but it doesn't necessarily change customers. Now, if we combine all three tactics, acquisition, retention, development and go back and ask the question again, if we had that one extra dollar to spend, where would we spend it — acquisition, retention or development? As we learned, most people and most companies, downplay acquisition and focus on retention and development. We do not want to minimize the importance of retention or development, but at the margin, we should be concentrating on acquisition. Again, this reflects customer-centric thinking that is very different from the traditional product-centric thinking. That's why thinking in a customer-centric manner and focusing on understanding heterogeneity can lead to dramatically different conclusions. This is not always true and should not be considered the golden rule. If we are in a very competitive market and we’ve saturated the market, every customer, every potential customer has already been acquired and sometimes worked with multiple firms, then focusing the extra dollar on acquisition might not make the most sense. The only customers who are left in the market place are probably customers that aren't very valuable and other companies were willing to let them go. There are lots of exceptions to this general advice, and again, if we're in a saturated market, hanging on to valuable customers is going to make more sense than acquiring new ones. Although, in general, for most companies and for most markets, when there's a lot of customers who haven't been fully evaluated by different companies, at the margin, an acquisition strategy makes more sense. More importantly, instead of reading how to spend money, we should be thinking about some of these marginal decisions. Understanding the tradeoffs between acquisition, retention, and development will shed light on the conventional wisdom that we associate with some of these tradeoffs. Conventional wisdom suggests that it costs more money to acquire a new customer than to retain one. Many companies work very hard to keep the ones that they have which makes a lot of sense. It probably does cost more to acquire a new customer, especially an excellent new customer, than to retain existing customers. Traditionally, companies spend too much time, and more importantly too much money, retaining customers who aren't that valuable. It may be better reaching a little bit higher, spending a little bit of money to find a customer or a group of customers who might be more valuable than some of those customers we're spending so much time trying to keep and develop. Again, the conventional wisdom might be right, but when we take this forward-looking value-oriented perspective -- if we're focusing more on customer life time value, as opposed to CPA -- then this kind of conventional wisdom won't impact us that much. Businesses should not be cheap or lazy about this perspective. By figuring out where the valuable customers, valuable potential customers reside and doing what it takes to get them on board, then nature can take its course. Businesses should spend time retaining them and companies should ask them if they want fries with that. Although better customers are going to stick around longer, they're going to buy more products and services from us naturally, and the gains will be realized in the long run. They'll be worth the investment. The writer, like many at one time, had a landline phone provided by AT&T. With the purchase of an Apple iPhone, I needed to choose a carrier for wireless service. The media was filled with promotions, charts, and graphs of coverage, and reports of dropped service. As I was familiar with AT&T, I choose AT&T, as my carrier. The number one reason, trust. Since the initial service, AT&T began to offer additional services. U-verse TV and Internet/WiFi service. The decision was made easier when at the time to make a decision AT&T installed glass fiber lines to a box on the edge of my property. The coup de grace was accomplished when they added new offerings to their cable TV package that appealed to my family. These are some of the tradeoffs between acquisition, retention, and development. Customer centricity is a celebration of heterogeneity. By really understanding the customer, by measuring and fully appreciating heterogeneity, it brings a new light on acquisition, retention, and development. The most significant opportunities to improve customer profitability is through intelligent strategies. Instead of venturing out and bringing in a bunch of customers as cheaply as possible, businesses can be more intelligent and look at customers, fully utilize all the data that they have on them and understand how, when and where to acquire them so that they can pursue the most valuable customers. Now retention and development are essential. A lot of attention will be spent on flighty customers who are likely to leave anyway, and it will cost a lot of money to keep them. We're going to have to keep spending over and over and over again. While businesses are tempted to do that, when they have these customers in their hand and want to maintain or build on the relationships they have with them, if they're not that great when it's going to be hard, expensive and frustrating to keep them around. Businesses need to spend appropriately on retention and indeed on development. We always want to ask that great question; “Do you want fries with that?” We still want to try different kinds of development activities to change customers. The final piece of that is let's not worry so much about conventional product-centric wisdom that we often use to run our marketing activities. Let's think about future looking customer value, CLV, and that's going to lead us to some very different kinds of decisions.